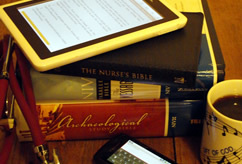 Four new Bible studies for nursing students are now available online. The NCF series, "What's Vital?" has expanded to eight studies covering topics that integrate faith, nursing and spiritual care. Morgan Hennessey is a world-changer. Morgan is a 2011 nursing graduate who is unemployed but not discouraged. God has nudged her to use this time of job-hunting to reach out to local nursing communities about how they can help combat human trafficking. "I understand now that nursing is a ministry," commented a nursing student who attended the NCF conference, "What's Vital: Basics in Spiritual Care" on October 22, 2011 in Durham, NC. When NCF Faculty Advisor Mary Lyons offered to pray for students before their exams, she was surprised to see more than 30 students respond to her invitation, out of a class of 44. Meet Joy, a nursing student and our newest NCF member! Joy will be traveling around the USA to report on how God is working on campuses and in the nursing world. Nursing graduates in the Spring 2011 class of East Carolina University College of Nursing left behind a unique senior class gift – far beyond the school's borders. Grab your laptop and gather some friends for an online Bible study featuring common questions about faith in Jesus. For 3 weeks the new NCF group at West Coast University, Anaheim has been meeting and growing under the leadership of Jon-Erick Rodrigo. A week before classes began at the University of South Florida, Chrissy Farr joined other members of her church for a 24/7 prayer watch for God's work on campuses in the area.